Raising Super Healthy Families is the goal of every parent. Moms and dads innately want the best for their beloved. 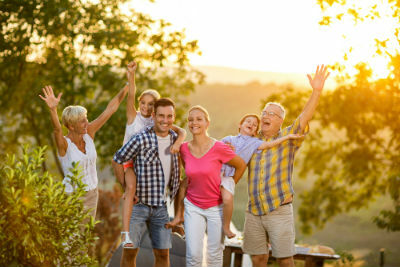 With the right health philosophy and action steps, you and your loved ones can enjoy an excellent quality of life together. Here’s a super healthy philosophy with some science and common sense to back it up. As long as there is no interference to this process, everything can develop perfectly and you are prepared to be delivered into this world. This Innate Intelligence stays with you after you are born. With the nervous system as its conduit, this intelligence controls and coordinates the function of your entire body. Keeping this system free from interference is essential to a healthy life. This Innate philosophy strengthens you. It keeps you healthy in mind and body. If you teach this philosophy to your children you will raise them as strong, confident individuals who trust their body, immune system, and genetic potential. They will be “super” healthy kids. Think about the impact of a “drug first” philosophy. When your baby gets sick for the first time, you have a choice. If you do not have confidence in your child’s natural immune system, you might immediately panic and give your child a drug. In their toddler years when they get a cold or infection you may give them a drug right away so they won’t “suffer”. Each time they say they do not feel good, rather than rely on their body’s innate wisdom, do you call in a prescription or go to the store and get them an over-the-counter drug? Your health care philosophy is your choice. The 100 Year Lifestyle and Chiropractic Lifestyle Care deliver an innate health care philosophy which is working for millions. It can also work for you and your family. Isn’t it time you begin trusting yourself and this innate philosophy and begin living the “super” healthy life that you and your children deserve?